Learn the basic safety principles for using the Fiber Arts Studio Sailrite Industrial Sewing Machine and make a canvas tote bag as a project. This class is required to be certified to use the Sailrite Industrial Sewing Machine during Open Industrial Sewing Machine Studio sessions. 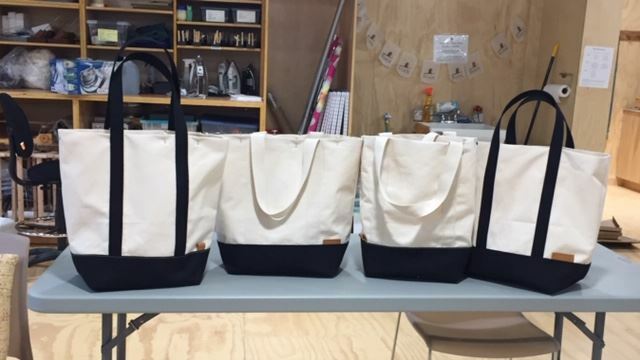 Use the Sailrite Industrial Sewing Machine and Reeds Sailmaker Industrial Sewing Machine to sew a canvas tote bag using a kit with pre-cut fabric provided by your instructor, Susan Morton. Materials Fee: $30. Precut fabric pattern pieces for tote bag. Skill Level: Intermediate/Advanced Beginner. Students should be familiar with using sewing machines and have experience sewing with a standard sewing machine. Instructor Bio: Susan Morton creates iconic canvas tote bags, backpacks and other durable and superbly made canvas products. Susan is a longtime Bainbridge Islander who can be found at the Bainbridge Farmers Market selling her hand sewn products. She receives rave reviews for her teaching style. She has been instrumental in helping the BARN Fiber Arts Studio industrial sewing program get off the ground and we feel very lucky to have her teaching this industrial sewing machine certification program for us.